Franklin Cohen’s family plays together, and stays together, especially when it comes to classical music. The Cleveland Orchestra’s principal clarinetist, his timpanist son, and violinist daughter are on a mission to bring world-class chamber music to Cleveland for at least two weeks every summer. Violinist Diana Cohen and her clarinetist father Franklin are co-artistic directors of ChamberFest Cleveland. 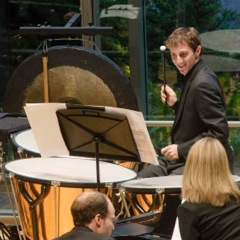 Timpanist Alexander Cohen is one of the 25 participating artists, and the second season is now underway. Among the highlights: the world premiere of Matan Porat’s “Start-Time” written for the family trio. It’s very contemporary and quite rare. Not many pieces are written for clarinet, violin and timpani. When Diana Cohen commissioned the piece she told the Israeli composer the title of the festival: “It’s About Time”, and he took it literally. At rehearsal, they laugh a lot but also hassle a bit about balance. Franklin Cohen asks his son to play the timpani more softly and Alexander says he’s playing as softly as he can. Franklin Cohen says it’s wonderful to have his children back in town and to perform with them, but sad that their mother won’t hear the music. ChamberFest Cleveland is dedicated to the memory of bassoonist Lynette Diers Cohen, who died in 2003. She was a champion of new music and one of the founding members of Cleveland’s Red: An Orchestra. The concerts began late last week and continue through Sunday with an encore of Porat’s “Start-Time” Saturday night at the Cleveland Institute of Music. This week the music of Brahms, Ravel, Gershwin, Stravinsky, Messiaen and more will be heard at six different venues including the Cleveland Institute of Music, Harkness Chapel at Case Western Reserve University and the Wine Spot in Cleveland Heights. Among the musicians in the festival are violist Yura Lee and cellist Robert deMaine of the L.A .Philharmonic, and some of Franklin Cohen’s students. In addition to being the Cleveland Orchestra’s principal clarinetist, he heads the clarinet program at CIM. 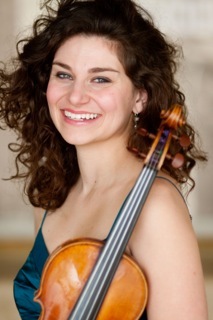 Diana Cohen started playing violin at age 5. She’s now the concertmaster of the Calgary Philharmonic where her brother Alex, who also fell in love with music at age 5, is the principal timpanist. They grew up playing music together and listening to Cleveland Orchestra musicians playing chamber music with their parents at home. “We’ve always had people over, eating, playing, talking, having a great time, laughing, crying together.” says Franklin Cohen. Tuesday June 25, 6 p.m. Composer Patrick Castillo on upcoming ChamberFest concerts. Wednesday June 26, Noon-1 p.m.
Wednesday June 26, 8 p.m.
Thursday June 27, 7 p.m.
Buster Keaton in the 1926 silent classic,”The General.” Musical accompaniment improvised by Israeli-born pianist and composer Matan Porat. Friday June 28, 8 p.m.
Saturday June 29, 8 p.m.
Stravinsky’s The Rite of Spring, 100th Anniversary. Sunday June 30, 3 p.m. The concert will be held in this historic landmark’s beautifully restored barn. Mendelssohn’s String Quintet No. 1 in A major, Op. 18. For more: chamberfestcleveland.com or call the Box Office at 216-785-9977 between 10 a.m. and 3 p.m. daily.